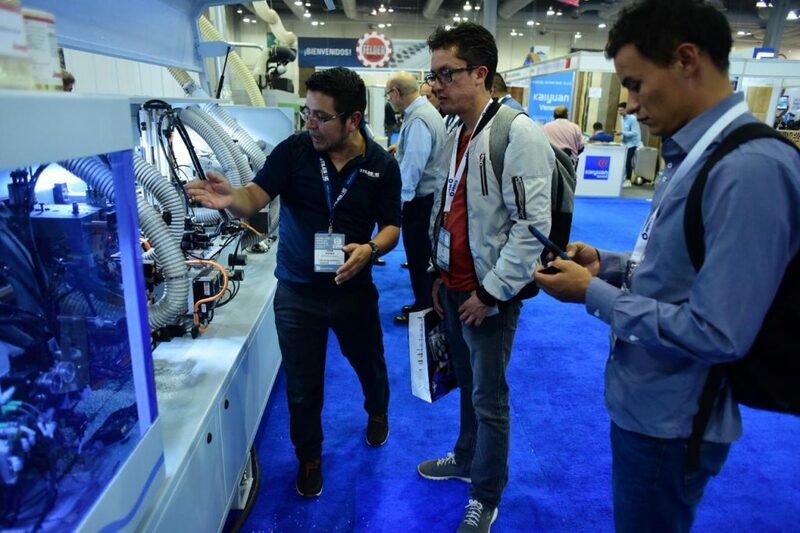 The 25th edition of MEM Industrial trade show underscored its reputation as a business platform that delivers for international exhibitors and visitors alike. 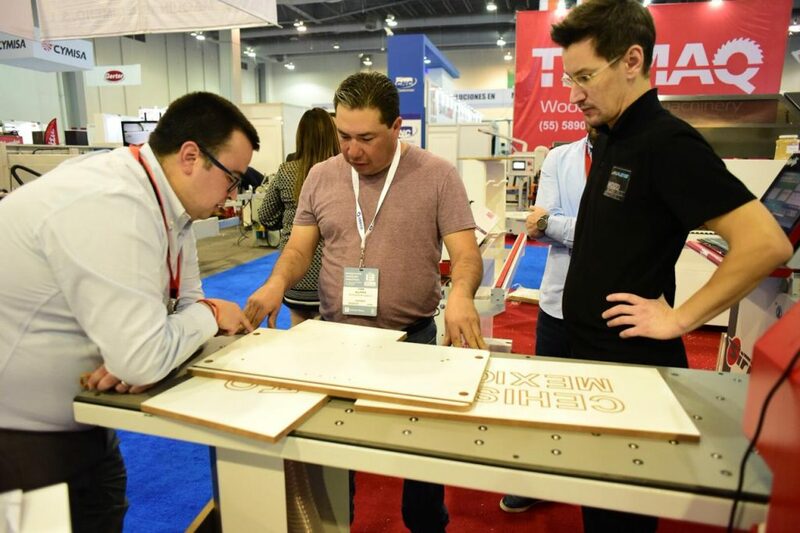 The successful partnership with AMPIMM, the Mexican Association of Wood Industry Suppliers, has given the show a new face and effectively transformed it into a one-stop shop turning MEM Industrial into Mexico’s leading showcase for the woodworking industry. As Christian Pfeiffer, Deutsche Messe’s Global Director of LIGNA & Woodworking Events, pointed out: “This year’s show put the spotlight on machines and accessories and featured a high-caliber conference program.” In fact, over 140 companies representing more than 230 brands from Mexico and around the world exhibited their latest products and solutions on over 10,000 square meters (107,640 sq.ft.). MEM Industrial offers a comprehensive overview of innovations and cutting-edge technology in wood processing and woodworking machinery as well as a wide variety of tools and equipment for custom and mass production, fittings, accessories, materials and panel product and sawmill technology. Featured exhibitors and brands of MEM19: Altendorf, Asia Robotica, Avella Forestal, Awuko, Big on Dry, Calegris / Biesse, CEHISA, CYMISA, DISMA, Eisenkraft, FELDER, HERMES, HOMAG GROUP / STILES MACHINERY, INHERMA, Industrias Filo, Industrias Guillas, Jowat, Kaeser Compresores, KWF, LEITZ, LEUCO, MADMAC, MAHEXA / WOODMIZER, MAPSES, MYPSA, OIMSA, OMAR, OPLEX, PATHROS, POWDERTRONIC, Renner Wood Coatings, Sangutti, Schmalz, SCM, SENCO, SERRA, SIDECO, Silverline, Skanor, TigerStop, TIGRA, Trimaq, VENJAKOB, Weinig / Holzher. MEM Industrial´s 25th edition attracted 4800 unique national and international attendees from the private and public sector including federal government bodies, ambassadors and special trade missions from Germany and Brazil, leading research universities (IBERO, La Salle, Universidad Panamericana) and representatives from key industry associations (AMPIMM, Eumabois, VDMA) with 98% of visitors having decision-making power and 66% assuming full business responsibility in the organizations they represent. MEM Industrial’s supporting conference program featured top-notch speakers and an impressive series of lectures and training seminars on the latest trends, developments and innovations in the wood and furniture industries. A total of 18 speakers from different backgrounds introduced and demonstrated live on-stage industry’s latest trends and technologies. Dennis Bieselt, representative of the German Woodworking Machinery Manufacturers’ Association (VDMA) described the pathway from simple CNC processing to fully integrated digital factories, further deepened by the know-how of world leading manufacturers (WEINIG, STILES/HOMAG) and complemented by subsequent talks on Industry 4.0 (DISMA), the possibilities of IoT (ASIA ROBOTICA), solutions for Integrated Manufacturing (LEITZ) as well as the impact of Digitalization across depart- ments from Finance to Marketing & Sales (imos AG). During the special panel session on day one of the show, academics and leading experts from different government bodies (COPARMEX, INECC) discussed a variety of topics, including compliance and certification for achieving sustainability along the value chain – a topic further developed by the final keynote by PwC´s Managing Director for Sustainability and Climate Change Carlos Mendoza Ayala. On day second and the third, members of AMPIMM offered hands-on seminars and workshops complementing the program with their broad expertise on varnishes, coatings, state of the art surface treatments and adhesives. During all three days, attendees were exposed to a diverse, full-length program that offered a glimpse into a wide range of new processes and solutions. In showing the trends and technologies for the New Age of Manufacturing, exhibitors and visitors alike were given a practical overview and guideline to access new market opportunities and boost their global competitiveness. The synergies stemming from the collaboration between AMPIMM, the Mexican Association of Suppliers of the Wood and Furniture Industry A.C., and Hannover Fairs México, S.A. de C.V., a regional subsidiary of the globally trade fair organizing company Deutsche Messe AG, allows for the consolidation of what is already the most important supplier event in machinery, equipment, materials and supplies for the transformation of wood and furniture manufacturing, expanding the call of participation to new companies and groups of product as well as facilitating the attraction of professional buyers of all the related sectors. The association´s main objective is to represent national importers, distributors and manufacturers of machinery, components, and raw material, as well as companies that provide services to the wood and furniture industry in Mexico. AMPIMM gathers all these actors for its representation, advocacy and information, in addition to providing training for the wood processing and woodworking industry. 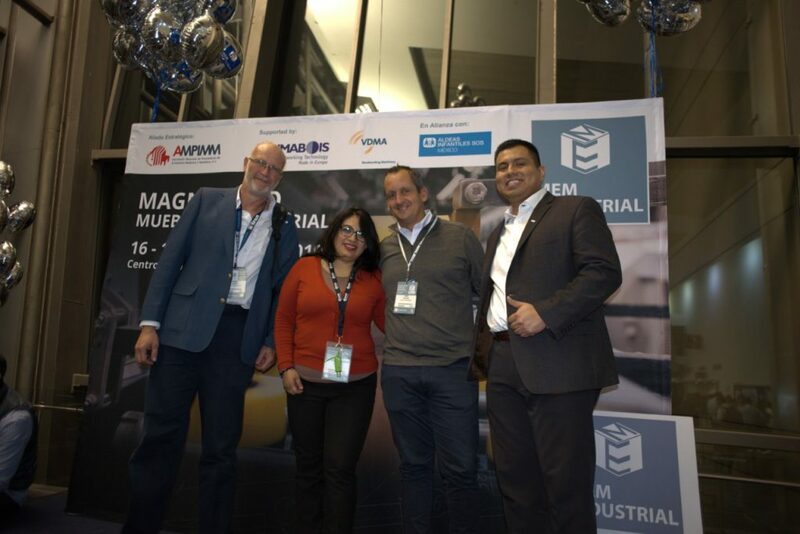 Thanks to the agreement struck between the two entities, from 2019 on AMPIMM and Hannover Fairs Mexico will join forces in Magna Expo Mueblera Industrial in order to provide the wood and furniture industries with a business platform that provides greater opportunities for marketing and networking, that facilitates the exchange of information and ideas, and that offers training and relevant content for the development of the national sector. • Germany’s national pavilion, which was aptly themed “Made in Germany”, featured a particularly high concentration of cutting-edge technologies as well as key technology trends. It featured exhibits by leading German companies and organizations, including Altendorf, Awuko, Kaeser Kompressoren, the German Forestry Council (KFW), imos AG, Schmalz, Serra, Tigra and Venjakob. It also provided an adequate stage for the exclusive reception organized by the German embassy on the second day of the trade fair. • Brazil’s first national pavilion at MEM Industrial surprised with a wide variety from machinery, specialized varnish and coating products to furniture fittings, including well-known brands as CIPATEX, RENNER Wood Coatings. Their joint participation was a clear statement for the growing interest in the opportunities of Mexico´s unique geographical and economical position as manufacturing powerhouse with ideal access to North and Central American markets. • China’s national pavilion also featured high-tech machines and applications from a number of companies, with Tiantai Tianmeida Machinery Co., Ltd and Linyl Lvran Decorative Material Co., Ltd. particularly standing out, testifying to the importance and attractiveness of the Mexican market. 2019 was the second consecutive time that China presented itself at MEM Industrial with a national pavilion. A definitive show highlight was the first-ever University Design Pavilion showcasing the work of young Mexican talents. Industrial and interior design students and graduates from Mexico’s most respected universities (IBERO, LA SALLE, UP, IDAC and UAM) used the pavilion to present their projects and network with industry professionals. “eco&smart” – this year’s theme reflected current trends and topics within the designer community, concentrating on the creation of “smart spaces for a greener tomorrow”. The presented projects had to be based on innovative concepts and fulfill at least two of the election criteria: multifunctionality, sustainability and outstanding design. For the students and young professionals, the participation in the University Pavilion not only represented a distinction for their creativity and a semester´s hard work but a unique experience to present and position themselves among internationally renowned companies making an important step forward into professionalizing their work and laying the foundations for their own career and future endeavors.